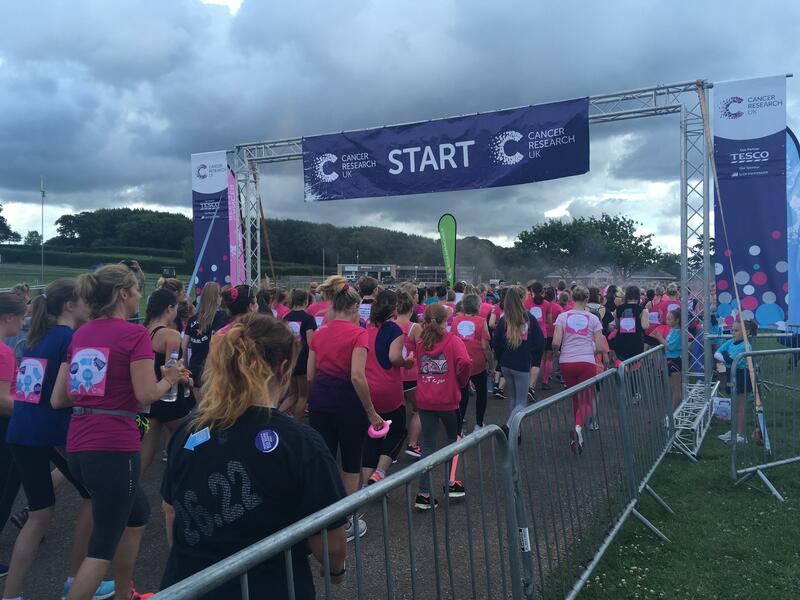 Westpoint Arena, Exeter became a sea of pink on Sunday as thousands of women joined the fight against cancer by taking part in Cancer Research UK’s Race for Life. Just under 4,000 mums, daughters, sisters and friends showed their incredible commitment to the cause as they came together over the weekend to help bring forward the day when all cancers are cured. Now organisers of the Pretty Muddy, 5k and 10k event are sending a heart-felt message of thanks to everyone who took part and all their supporters. And they’re asking them to make every step count by paying in their sponsorship money as soon as possible so that it can be used to fund life-saving research. Cancer Research UK’s Race for Life, in partnership with Tesco, is an inspiring women-only series of Race for Life events which raises millions of pounds every year to find new ways to tackle cancer. “Our participants play a crucial role in helping to turn discoveries made in the lab into better treatments for patients in Exeter and across the UK and we’d like to thank everyone who took part in the event on Saturday and Sunday. “The atmosphere on the day was electric - full of emotion, courage, tears and laughter - as thousands of like-minded ladies came together to unite in the fight against cancer. Now we’re asking everyone who took part, and all the friends, family and colleagues who pledged to sponsor them, to return the money they’ve raised as soon as possible. One in two people in the UK will be diagnosed with cancer at some stage in their lives, but the good news is more people are surviving the disease now than ever before. Cancer survival has doubled since the early 1970s and Cancer Research UK’s work has been at the heart of that progress. Cancer Research UK’s life-saving work relies on the public’s support. Thanks to the generosity of its supporters, the charity was able to spend around £2 million last year in the South West on some of the UK’s leading scientific and clinical research - helping more men, women and children survive. Dr Áine McCarthy, Cancer Research UK’s Senior Science Communications Officer, said: “We want to see people with every type of cancer, including those that are hard to treat, have the best chance of surviving their disease and living a long, healthy life afterwards. The advances we've made since Race for Life started in 1994 show we are moving in the right direction. “Thanks to new treatments and improvements in early diagnosis, more people are surviving cancer today than ever before. But too many lives are still lost. There are hundreds of types of cancer and we need continued investment in research to help us find new ways to prevent, diagnose and treat them all. Sponsorship money can be paid in online, by phone, by cheque or in person at a Cancer Research UK shop.